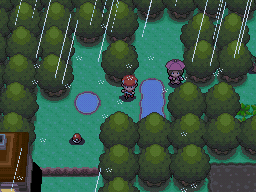 Once in Pastoria City, talk to the girl with the umbrella for a Piplup Mask. Go south of the Pokemon Center and then east to pick up Persim Berries and Nanab Berries. In the house directly south of the Berries, you'll find the Move Tutor. He'll teach your one of your Pokemon a move it would get by leveling up to its current level if you provide him with a Heart Scale. In the house across from the Pokemon Mart, the lady inside will give you a different Berry everyday. After learning Surf, surf across the water in the south side of Marsh City to pick up Mystic Water. Now it's gym time! 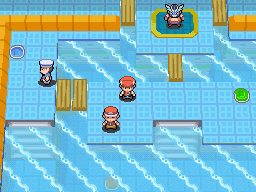 Pastoria City's gym is full of water. 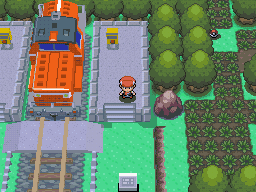 Like the previous gym, you have to solve a bit of a puzzle in order to reach the Gym Leader. The gym has walking platforms at three levels with the water level being controlled by three types of buttons. The orange button will lower the water completely, allowing you to access all three levels. The green button sets the water level to the middle, preventing you from accessing the lowest level. The blue button raises the water such that you'll only be able to walk on the top-most level. The water will then raise or lower the yellow connectors between platforms. First, head to the bottom-left side of the gym and step on the orange button. Go past the green button and go all the way up the stairs. Step on the green button you see. Next, go all the way left and step on the blue button. Head to the top-right side of the gym and step on the green button. Go down one level and step on the orange button at the bottom-right side. Now go to the upper-left side to the top-most level and step on the blue button. Now you'll get access to the Gym Leader. Crasher Wake, the Gym Leader, uses a lv. 27 Gyarados, a lv. 27 Quagsire, and a lv. 30 Floatzel. He'll award you the Fen Badge and TM55 - Brine for defeating him. Go to the north of Pastoria City to go to the Great Marsh. This is the Safari Zone of Sinnoh. You pay $500 for 30 Safari Balls, which you use to catch Pokemon while in the Great Marsh. You will definitely want to visit this place at least once so you can get HM05 - Defog from the lady near the entrance. More information regarding the Great Marsh will be up later. Talk to the Galactic Grunt standing outside of the Great Marsh so he can leave. Head east, and you'll find him still standing there. Talk to him again to really make him go away. Right afterwards, Rival will come over to battle you. His Pokemon are all below lv. 30, so at this point, he shouldn't be too hard to defeat. After that, you can either head west to go through Route 212 (which is pretty much optional) or go back east to continue chasing the Galactic Grunt. We'll first consider going through Route 212 from the west. Route 212 is a straightforward walk westward. First pick up the Berries near the beginning. You'll find TM06 - Toxic near the marsh area past the two little trees. You can also cut those trees to go across the thin bridge. On the other side, you'll find an X Special. Keep on going west from there until you pick up the Zinc. Keep going west and you'll find some Fishermen. After learning Surf, you can surf west a little and pick up a hidden Protein on the land. To get to the itemball on the small island (which turns out to be a TM), go west a little and cross the thin bridge. If you know Surf, then you can surf across the pond to pick up TM84 - Poison Jab. To go across the other thin bridges, head north and chop the trees. Once you're on the "other side", you can pick up an Antidote near the south. When you can't go west any longer, go north, and it'll stop raining. There's an Elixir partially hidden from view behind a sign. Again, if you know Surf, you can surf across the pond to pick up some Berries. Cut the tree north of the large pond to pick up TM11 - Sunny Day. Along this section, you can pick up Berries and fight two trainers. There are many police officers who will only battle you at night. Here, you'll also find the Pokemon Mansion. For now, the two rooms on either end of the Pokemon Mansion are off limits until you obtain the National Dex. However, you still have a lot to do; namely, a lot of items to pick up. Explore every room, and you'll pick up a Great Ball, a Soothe Ball, a Burn Heal (found in a trash can), and TM87 - Swagger. 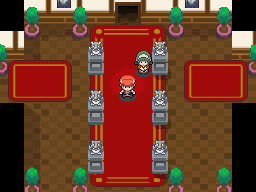 The room straight down the red carpet leads you to the Trohpy Garden, where you can find some Pokemon in the patch of grass. Surf across the pond next to the Pokemon Mansion (if you can) for a Rose Incense. After this, you should fly back to Pastoria City. Depending on if you chose to explore Route 212 or decided to ignore that route, you need to go east from Pastoria City to chase the Galactic Grunt you scared away earlier. On the beach on Route 213, you'll find him standing next to a Fisherman, thinking out loud. Talk to him, and he'll go further east. Follow him, and you'll find him again east of the restaurant full of trainers. Talk to him, and again, he'll leave, going north a little. Now he'll battle you after you talk to him once more. 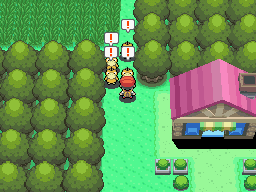 After the battle, go north a little and you'll find Cynthia, who'll give you a SecretPotion to clear the group of Psyduck blocking the road on Route 210. Now, fly over to Veilstone City (or you can go north a bit more to get there) and head west from there to get to the Psyduck on Route 210. Getting past Route 215 is a simple matter of hopping over ledges. Go up to the Psyduck to use the SecretPotion you obtained and the Psyduck will disperse. Afterwards, Cynthia will come over to give you an errand. She wants you to deliver an Old Charm to her grandma in Celestic Town. Go north to continue on Route 210. First grab the Super Repel under the tree on the left side. Within this tall grass, there are three Ninja Boys who you can battle. You'll notice them by seeing abnormal lumps in the grass. At the center of this large patch of grass, you can pick up a Hyper Potion. After the tall grass, you'll find an Ultra Ball in the north-east corner of the regular grass. As you go north, you'll encounter some really thick fog. You might want to use Defog to get rid of it. Head north-west. Go up the two sets of steps. After learning Rock Climb, climb east-ward (down and then up), and battle the Dragon Tamer. Inside the house you see, an old lady can teach your Pokemon a Dragon-type move. Go west a little and down the stairs to pick up a hidden Nugget on the ground. Now go climb back to where you were originally. Go all the way west by crossing the regular bridge and thin bridge, fight the Ninja Boy, and go south to pick up TM30 - Shadowball. Go back east a little and head south now. Pick up the Smoke Ball and continue west. After battling the Veteran, head north a little to pick up a bunch of Berries. If you keep heading west, you'll reach Celestic Town.